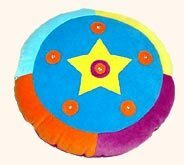 Amuse your child with this big starred pillow, cushion and bolsters. The finished product will reflect high-end designing and quality fabrics. They are available in various colors and dimensions. The smaller sizes are in more demand because kids are crazy for it. The fabric does not get dirty easily and can be placed for regular use. 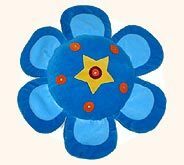 Desc : Round shaped star design cushions are printed in a variety of soothing colors and posses yellow star on blue base. 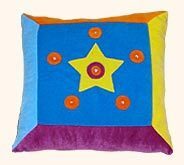 Desc : This designer cushion in rectangular shape and having star design adds a colorful touch to the childhood of innocent kids. 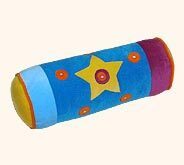 Desc : Beautifully embellished with the designs of star, this decorative bolster will certainly allure the friends of owner kid immediately. Desc : Rectangular multicolor pillows exhibit the remarkable combination of light & dark blue, maroon, red and yellow and delight the kids with colorful look. 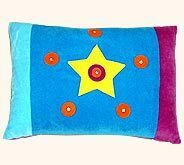 Desc : Fascinatingly designed, this designer pillow depicts the pictorial scene of flower and star at the same time with its shape and design.